Eating habits of the many creatures of the animal kingdom are difficult to guess. Some animals feast mostly on fish, while others prefer tree bark, for just a couple examples. Porcupines are spiky and relatively large rodents that consume a high amount of plant matter. The prickly critters are herbivorous. The typical porcupine diet consists mostly of plant matter -- think tubers, buds, fruit, bark, carrots, potatoes and cassava -- according to the African Wildlife Foundation. During the wintertime, porcupines eat a lot of tree bark, as well. 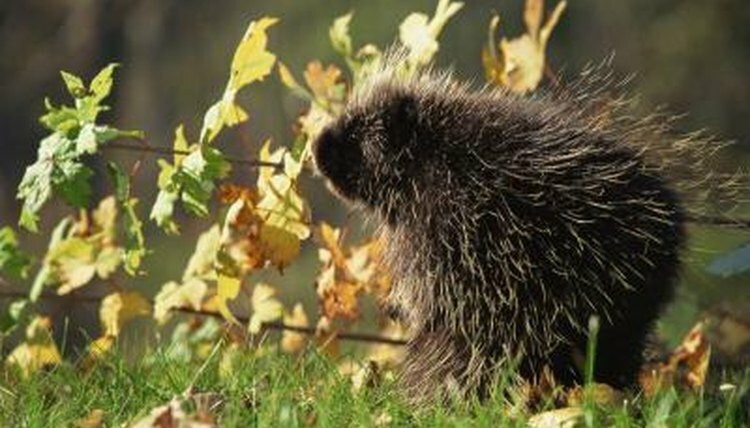 Porcupines frequently feed on a variety of trees, including larch, red spruce, white pine, beech, yellow birch and sugar maple, according to the ESF Adirondack Ecological Center. Apart from bark and cambium, porcupines also often consume leaves and stems. Although porcupines are generally herbivorous, exceptions exist. In rare instances, porcupines may munch on the meat of decaying animal carcasses. When porcupines do this, they generally carry a carcass over to their own burrows. Like many other animals' diets, porcupine diets transform throughout the seasons, although they stay predominantly plant eaters. In wintertime, porcupines turn to trees for sustenance, from the cambium and the bark to even the pine needles. Porcupines are especially fond of white pine needles. During the summer, porcupines consume diverse varieties of other things, such as nuts, herbs, acorns, beechnuts, berries and fruits. Porcupines often have penchants for eating salty substances due to their potassium-packed summer month eating habits. The rodents frequently travel inside of ponds on quests for food with significant sodium levels, including aquatic plants like waterlilies. Porcupines sometimes receive their sodium from chewing on manmade objects such as canoe paddles, tool handles, tires and brake lines. In the wintertime, it sometimes is rather easy to observe what exactly a porcupine has been eating. If you notice a tree's trunk has been entirely uncovered or that the bark has been taken off all of its branches, a porcupine may just have had a very tasty meal in the spot you're looking at.